Released 2 June 1986, reached no 1, on chart for 63 weeks, achieved 2x Platinum status. Album length 40:42, 2011 bonus EP length 30:25. Tracks 1, 3, 4, 5 and 9 produced by Queen and Mack, engineered by Mack. Tracks 2, 6, 7, 8 produced by Queen and David Richards, engineered by David Richards. Bonus material mastered by Adam Ayan, except track 2 by Bob Ludwig, at Gateway Mastering Studios, Portland, Maine, audio restoration by Kris Fredriksson. Six of the tracks on the album appear in the 1986 film 'Highlander'. See also the 'Highlander' Promo CD, which is a related, but totally different, promotional release. Track 1. Written by Queen, with original ideas from Roger. Length 5:09. This track was also released as a remixed instrumental track, retitled as 'Blurred Vision'. The 'Queen Rocks' album features the full album version. Excerpts from the recording of the track appear on the 'The Magic Years - Volume I' video and 'Greatest Video Hits II' DVD, as the Making Of 'One Vision' feature. The Greatest Video Hits II DVD also features a mimed performance of the single version from Montreux 1986 and a surround sound mix. Details are also available of two unreleased early versions, and another early demo titled 'A Kind Of Vision' which features elements from both this track and 'A Kind Of Magic'. Track 2. Written by Roger Taylor. Length 4:24. The extended version was edited and retitled as 'A Kind Of 'A Kind Of Magic'' and appears on the original UK and US CD albums. The Greatest Video Hits II DVD features a mimed performance of the album version from Montreux 1986 and a surround sound mix. An early demo titled 'A Kind Of Vision' featured elements from both this track and 'One Vision'. Track 3. Written by John Deacon. Length 4:27. Track 4. Written by Freddie Mercury and John Deacon. Length 4:21. Track 5. Written by Freddie Mercury and John Deacon. Length 4:07. The extended version was edited and retitled as 'Friends Will Be Friends Will Be Friends' and appears on the original UK and US CD albums, and the 2011 double-disc reissue. The drums at the very end of the video on 'Greatest Video Hits II' are slightly different to that on 'Greatest Flix II'. Track 6. Written by Brian May. Length 5:14. Brian May sings the first verse and some other lead vocals. The track also features the National Philharmonic Orchestra, arranged by Michael Kamen and Brian May, and recorded by Eric Thomlinson at Abbey Road Studios. This track is also available as a piano version called 'Forever', which appears on the original UK and US CD albums, the Hollywood Records CD album, and also the 'Highlander' promo CD, labelled as a demo. The 'Classic Queen' album contains the full album version, while 'Greatest Hits II' and 'Absolute Greatest' contain an edit. This track was later recorded by Ian & Belinda featuring Brian, Roger and John, and as a duet by Jennifer Rush and Brian May. Details are also available of the 'Greatest Video Hits II' surround sound mix and an early demo. Track 7. Written by Brian May. Length 4:32. All lyrics in italics are taken from the film 'Highlander'. The opening dialogue comes from a news report, while the other dialogue is spoken by Kurgan (Clancy Brown). The four versions for 'The Eye' are identical, apart from the vocals which are included. Track 8. Written by Roger Taylor. Length 4:38. Joan Armatrading provides incidental vocals for this track. Parts of the second film version were also used in a trailer for the film. Track 9. Written by Freddie Mercury. Length 3:31. Parts of the film version were also used in a trailer for the film. Other edits were used in the various 'Highliander' TV series, but as they are unreleased, they will not be included here. Details are also available of the 'Greatest Video Hits II' surround sound mix and an early master Townhouse demo. Written by Roger Taylor. Length 3:36. This track is simply the second half of the extended version of 'A Kind Of Magic'. The track is only available as track 10 on the original UK and US CD albums, and was omitted from the 2011 double-disc reissue. Written by Freddie Mercury and John Deacon. Length 5:57. This is an edit of the extended version of 'Friends Will Be Friends'. The track is available as track 11 on the original UK and US CD albums, and as a bonus track on the 2011 double-disc reissue. Written by Brian May. Length 3:20. This track is a piano version of 'Who Wants To Live Forever'. The track is available as track 12 on the original UK and US CD albums, on the US Hollywood Records CD album, and as a bonus track on the 2011 double-disc reissue. It also appears on the 12" single, in the 'Queen Singles Collection 3' boxed set, within the 'Queen: The Eye' game, on the double disc 'Forever' compilation, and on the 'Highlander' promo CD, incorrectly described as a demo. Non Album Track. Written by Queen. Length 4:41. This track is only available on the 'One Vision' singles, in the boxed-set only 'Complete Vision' LP, and in the 'Queen Singles Collection 3' boxed set. The track is derived from 'One Vision'; it is very similar to the album version from 3:51 to 4:25. It has very prominent percussion, and retains only selected vocals from the original. It also retains some of the ending of the song (from about 4:25 onwards), but adds a new keyboard outro. Non Album Track. Written by Roger Taylor. This track is only available on the 'A Kind Of Magic' singles in the UK, or on the 'Princes Of The Universe' single in the USA. It is an instrumental remix of 'Don't Lose Your Head'. Available on the 2011 double-disc reissue only. Length 3:22. 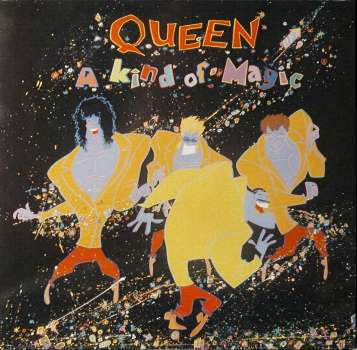 This is a demo version, recorded in August 1985, which features elements of both 'A Kind Of Magic' and 'One Vision', which were later split into two separate songs. It features Freddie on vocals, with a drum machine beat and synthesisers. The lyrics, while similar to those later included in both songs, are obviously incomplete, so the track features the same verses repeated, with a few lyric changes. Non Album Track. Written by Fred Ebb. Length 0:36. This track was originally recorded by Liza Minelli in 1977 and later by Frank Sinatra, which reached no. 4 when re-released in 1986. This was the first non-live Queen track to be released which they did not write (one of only two to date). The track is only available in the 'Highlander' film, and segues from the longer version of 'Don't Lose Your Head'. Non Album Track. Presumably written by Brian May. This track features Brian May playing the piano, and does not appear as part of any other track. It appears on the 'The Magic Years - Volume I' video and on 'Greatest Video Hits II' within 'The Making Of One Vision', and is approximately 1:05 in length. The version on 'Greatest Video Hits II' begins over the top of an excerpt of 'One Vision', whilst the version on 'Magic Years' has interviews over the top, however the two versions are otherwise very similar. Some sources suggest this song evolved into the 2008 Queen + Paul Rodgers track 'Some Things That Glitter', but I cannot hear any similarities myself. Available on the standard UK 'Highlander' DVD and the US 'Immortal Edition' DVD as an extra feature. Length 0:53. This is a medley comprising part of 'Don't Lose Your Head' and 'Princes Of The Universe'. The versions seem slightly 'rougher' than the film versions, and feature different dialogue. The medley features 0:11 to 0:40 of 'Don't Lose Your Head' (version 2) and 0:32 to 0:56 of 'Princes Of The Universe', and ends in a fade.